"The only thing we are trying to do is give the people the opportunity to vote. We’re not, in this bill, arguing the merits for or against the city other than verifying whether it’s fiscally viable" [Shapiro (5 March 2014). Senate Committee Mulls South Fulton Cityhood Bill. WABE-FM. Retrieved on 9 March 2015.]. State Senator Donzella James (D - Atlanta), the sponsor of the two Senate bills listed above, often echoes the sentiments of Rep. Bruce. "I support the right of South Fulton to determine their own destiny," Senator James has said at many community meetings. For the Sandtown community, the right to vote on their future could come as soon as November 2015 under a proposal floating around the State Captiol. Atlanta Progressive News reports that the Georgia General Assembly is being asked to approve a referendum allowing the Sandtown community to vote on annexing into the City of Atlanta [Cardinale (9 March 2015). City of Atlanta Proposing Major Southwest Expansion to Legislature. Atlanta Progressive News. Retrived on 9 March 2015.]. 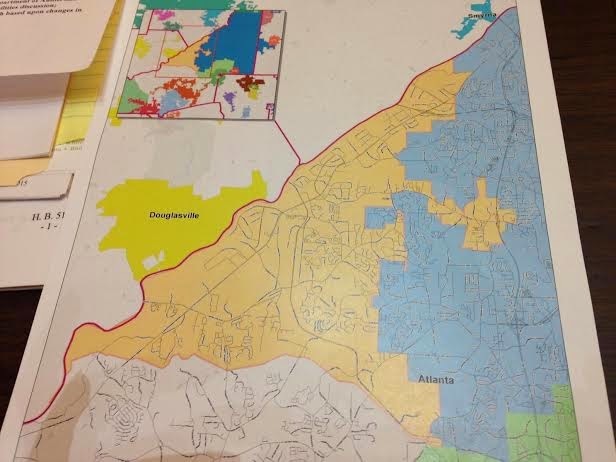 While legislation calling for a referendum has yet to be introduced, a map (shown right) exists of the area that would vote on joining Atlanta. State law mandates that, "if the number of residents in the area to be annexed exceeds 3 percent of the population of the municipal corporation or 500 people, whichever is less, as determined by the most recent United States decennial census, referendum approval shall be required in the area to be annexed." The earliest a Sandtown referendum on Atlanta annexation can occur is the 2015 November General Election. If voters say yes to Atlanta, the annexed area would no longer be included in the proposed city of South Fulton being marshaled through the legislature by Rep. Bruce and Sen. James. Stay logged on to Georgia Unfiltered for this continuing story as it updates.